Here, Greg and his daughter, Chloe, pause to soak up the scenery in South Africa. I don't come from a hunting family, but I've hunted an awful lot the last 26 years. My travels have taken me to 24 countries on six continents. I've enjoyed every one of the days I spent afield, but as great as those hunts were, they were largely solo journeys that had me far from hearth and home. I always envied friends who hunted with their fathers, brothers, or children, and I often dreamt of hunting with my own children one day. When my children, Chloe and Cole, were born, I couldn't wait for them to be old enough to join me and I prayed they would share my passion for hunting. I started my kids on BB guns at the age of three, and .22s at five. Chloe was very interested in hunting and shot well enough that I took her on her first hunt a month shy of her sixth birthday. She showed an impressive amount of patience and maturity for her age, staying optimistic and cheery on a very slow hunt. Her patience and maturity paid off the last night when she dropped a grizzled old axis buck at a little over 120 yards. The memory of that tiny girl with the giant grin dwarfed between the buck's 30-inch antlers and a rifle as big as her still makes me smile. Cole got started the next year. Like his sister, he was a month shy of his sixth birthday, but he was nowhere near as mature or patient as Chloe. 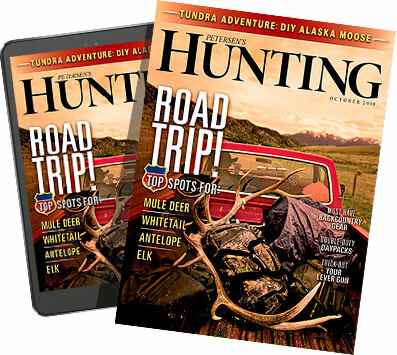 He drilled his buck neatly on the shoulder when he got the chance and he seemed to enjoy himself, but he was definitely more interested in shooting than the other stuff that makes a hunt. But he was young, and I was thrilled that he seemed to enjoy the time we shared afield. I hunted a lot with my kids the next few years. We didn't always get what we went for, but we really enjoyed our time together away from ringing cell phones and never-ending deadlines. We spent our time plinking, taking walks in the woods, and cutting up around the campfire. For some reason, our hunting camp conversations were always deeper and more meaningful than the ones we had at home. Every trip seemed to yield a few brief, precious moments I'll forever remember in Technicolor. I really enjoyed watching my kids grow as hunters and people over the course of those three years. Both were becoming pretty good hunters and darn fine marksmen, and we were getting to know each other on a level I fear too few parents know their children. 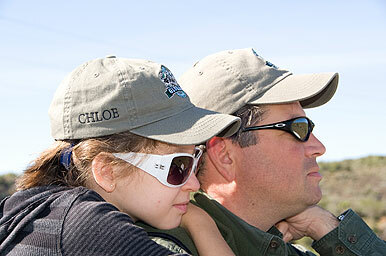 We were on the tail end of a great third deer season hunting as a family when we learned that Chloe had leukemia. The diagnosis was devastating but the prognosis was good, so we soldiered on with Chloe's chemo and tried to live life as normally as a bald-headed little girl with a wheelbarrow full of drugs can. It was an awful big load for an eight-year-old to bear, but she bore it with a quiet strength I never would have guessed my little angel possessed. She continued to hunt during her two-year course of chemotherapy. It was on one of those deer hunts at the tail end of her chemo that she made me promise to take her to Africa when she completed her treatment. We started planning our safari as soon as we got home. The next few months flew by, but we managed to work in a lot of practice and the kids made their wish lists while I tried to teach them about budgets. During the planning phase, Chloe decided to spend just a few days hunting because she wanted to join the rest of the ladies in our group on a four-day tour along the Garden Route. I was sad, but I didn't let her know it. By the time we left for South Africa's Eastern Cape a few months later, I had accepted her waning interest and was looking forward to hunting Africa with Cole. Cole and I started hunting the minute we arrived. We began with a long walk in the hills. We were looking for a big kudu bull or impala ram for Cole but in truth, I just wanted to let him soak up a bit of Africa. We snuck up to within 25 yards of a warthog sow and we saw several impala rams and kudu bulls, but we didn't see anything to shoot. But our little walk gave Cole a chance to get his first taste of African hunting. He clearly liked it, because he chattered excitedly about all he'd seen as we walked back to the truck. We stopped on top of the last hill to soak up Cole's first African sunset. The next day, we walked for miles up and down those big, brushy hills in search of a big kudu or impala. We saw plenty, but we weren't having any luck getting within range. I was a bit worried that he might get bored or frustrated, but Cole just kept pumping those little legs up and down the hills, smiling and asking questions the entire time. It seemed my boy had matured a lot in the previous few years. It's a good thing, because the next day was every bit as frustrating as the first. We didn't have any luck the third morning either, but we had a heck of a time playing cat-and-mouse with a wily old kudu bull on a brush-choked hill. That evening, we spotted another great kudu feeding in a little valley. We eased as close as we dared, then got Cole up on the sticks. The range was 165 yards, but he was confident, so I reminded him of his shot placement and turned him loose. A second later, his little .260 bucked and the bull bolted, its shoulder shattered. I've never seen my son stand as tall as he did as we stood admiring his big kudu. Things picked up quickly the next day. We found a herd of blesbok after lunch and Cole dropped one with a perfect shot from 120 yards. Fifteen minutes later, he took a 208-yard shot at a nice impala ram. He said the shot felt perfect but the ram bolted as if it hadn't been touched. But Cole insisted that he'd hit it and the tracker backed him up, so we walked over to where the ram stood at the shot and, shortly, found a brilliant crimson splash. Fifteen yards further we found the ram piled up in a bush with a neat little .260 hole through both shoulders. That evening, Cole took a very nice duiker with another perfect shot from his little Browning. Around the fire, his marksmanship earned a lot of attention from the other hunters. He's usually kind of shy in big groups, but he seemed to light up when the men started asking him about his hunt. We left to hunt for a caracal on another property the next day. The dogs struck a big track bright and early. We crashed and bulled our way behind them through the dense, coastal brush and vines as best we could for the better part of two hours before we finally caught up to them. They had the big lynx treed, but the tomcat bailed as soon as it saw us. Our crew took off again, but this time the dogs treed the cat quickly. It sat high up a tall, straight tree, watching us. I must have felt safe because it was content to sit on its perch and watch the show below. It even yawned once or twice. Unfortunately, the thick brush that surrounded the tree forced Cole to get almost at the base of the tree to shoot. The angle was so steep he had to shoot from a sitting position with his shooting sticks at standing height. He drilled the cat, but he got a Boddington-sized scope eye for his troubles. I've never seen the equal of Cole's caracal. Neither had the PHs. Pride and adrenaline helped my 56-pound boy hold up the 40-pound cat through the entire photo session. I'll never forget Cole's smile as he held his cat, or how proud and animated he was as he told the story of his caracal hunt around the fire later. The next morning, we went out in pursuit of a big lechwe, but we spotted a huge zebra stallion — the last animal on Cole's list — right off the bat. It was in a big herd so it took a while to get within range and even longer to make sure Cole was on the right one, but once the stallion pranced off to the side he sent a 120-grain TSX crashing through its shoulder. That single shot did the job, but zebras are tough — the tenacious disco donkey covered a few hundred yards before it expired right next to a road. We returned to Blaauwkrantz Safaris the next morning, where we caught up with the ladies. Chloe and my wife, Lisa, were still giddy from their Garden Route tour. They'd visited a few day spas, gone on a jungle canopy tour, played with baby lions, and shopped their tails off. But Chloe was ready to hunt, so we headed out to make the most of our last two days. Francois knew where a nice bull had been feeding fairly regularly. We snuck up an overlook well before dark in hopes that the ancient bull would make an appearance. Kudu began picking their way through the valley soon after we got comfortable in the corpse of a long-abandoned blind in some heavy brush. We saw some young bulls and lots of cows, but no shooters. As we waited, a rustling behind us turned into a giant tortoise that walked right into our laps. Chloe and I giggled and snapped photos of the hapless tortoise as Francois shot us dirty looks. "There's a big bull moving about in the bushes on the other side of the valley. Cut that out", our African party-pooper scolded. We were tossing pebbles at Francois and doing our best to get under his skin when he threw up a finger and gave me the look. I dropped to a knee, handed Chloe her rifle and helped her ease it onto a branch. Shortly, an old, heavy-horned bull ambled out into the open. Chloe spotted the bull immediately. She slid her rifle into position, plastered the reticle on its shoulder, and then settled into her pre-shot routine. When she was ready, she asked me to put my hand on her back, and then she let out a breath and slowly squeezed the trigger. The bull bolted at the shot, but Francois followed it with his binocular. An instant later, he pumped his fist and said, simply, "Down. Good shot, Chloe." Daylight was fading fast, so I grabbed my camera and we charged down the hill to see Chloe's bull. Chloe was shocked at its size. Though she's grown up with a kudu mount over the fireplace, she never realized how big they really are until she walked up to hers. She was particularly pleased with herself for shooting the bull so well and killing it cleanly. I was proud of the way she held it together despite my obvious excitement and made the most of what could have been her only opportunity. As Francois ran back to get the truck, Chloe and I sat with her kudu and talked about the hunt and all the things she'd experienced on her sightseeing expedition. She jabbered on about the animals she'd seen, the fun she'd had, and all the things she'd learned. And then she just quit talking, grabbed my hand, put her little head on my shoulder, and watched that giant, African sun sink behind the mountains. Our family safari was last August. Six months and another great deer season after our return, Chloe's leukemia has returned. As I write this, she is in the battle of her young life. Chemotherapy has ravaged her little body, and her suffering has broken our hearts. Her prognosis is good, but she's facing a long, arduous battle no child should have to face. As difficult as it is to watch Chloe suffer through the treatment process once again, I can always count on the memories of the chilly sunrises, warm sunsets, mischief and milestones we've shared to make those tough times a little more bearable. I can only pray that we get the chance to make even more of those precious moments.